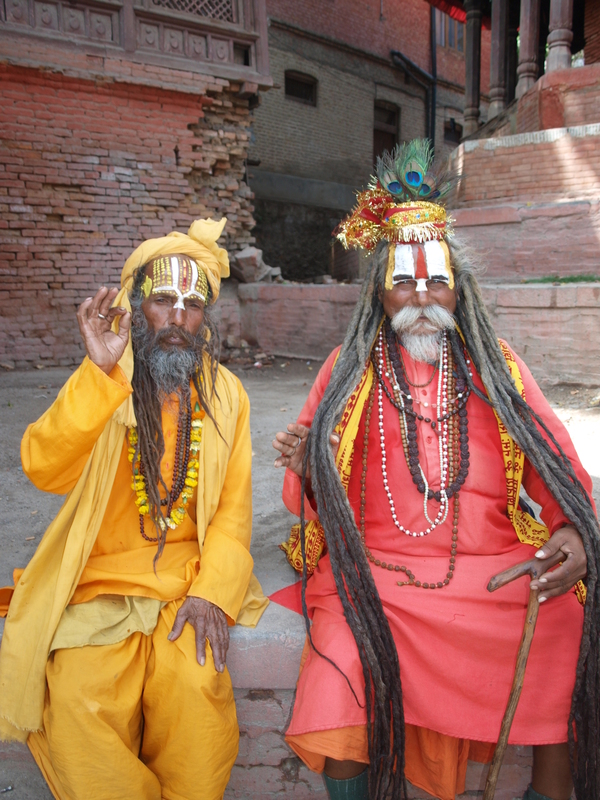 Kathmandu is an insanely chaotic, loud, smelly, and colorful city. 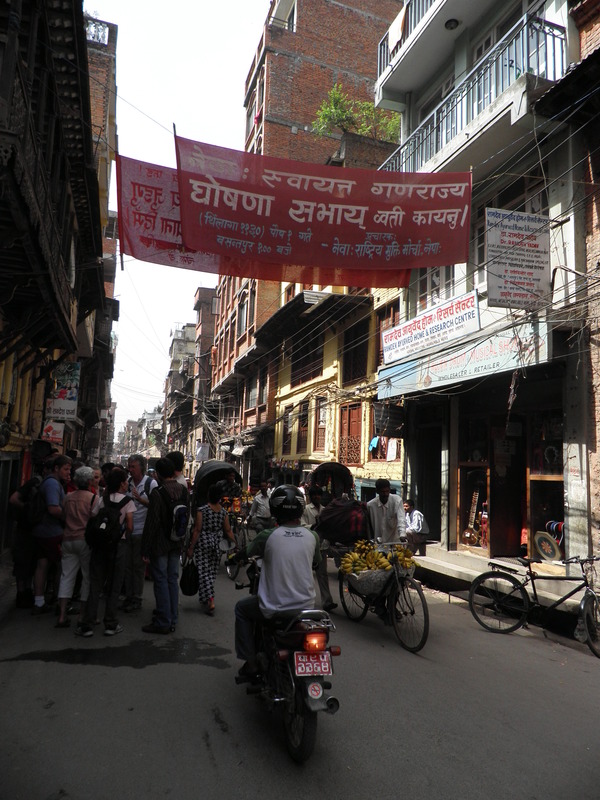 Navigating the town is a true feat; the narrow shop-lined streets are packed with people, piles of trash, cars, motorcycles, rickshaws, and you’ll even spot an occasional cow or monkey meandering through traffic. One evening our taxi turned down a one way street to come head-to-head with another car…neither of them budged but instead sat there honking their horns at one another for five minutes until finally our friend insisted that our driver move out of the way. It’s amazing that anyone gets anywhere in this city. 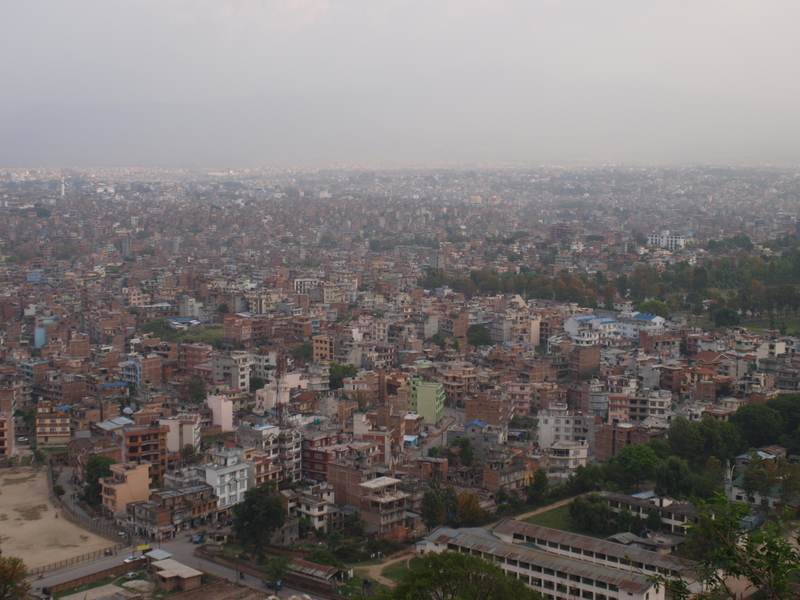 Despite the craziness, Kelly and I enjoyed Kathmandu. Thamel, where our guesthouse was located, is a touristy area in regards to restaurants and shops, but we didn’t actually SEE many tourists. Sure, there was a handful, but after the backpacker madness of Thailand, we were thrilled to be walking around amongst so many locals. 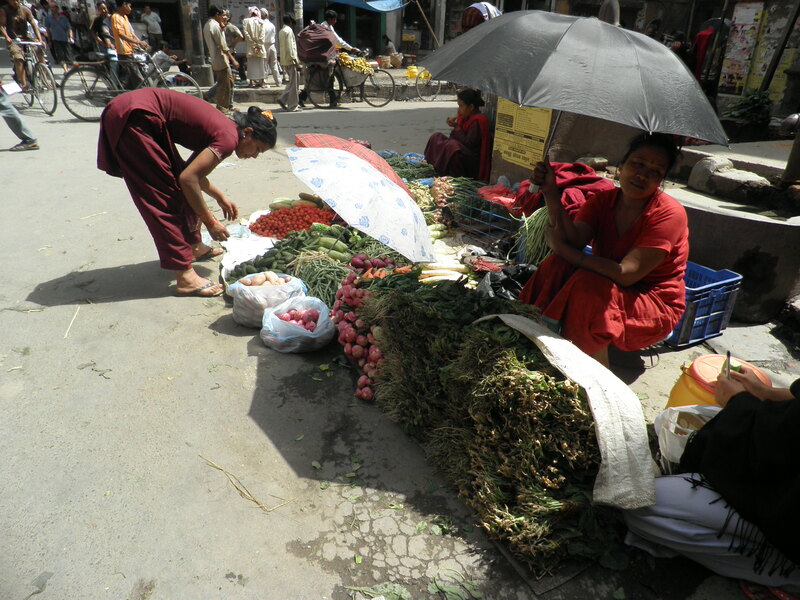 One of our favorite ways to spend time would be to get lost wandering through the alleyways while admiring the multitude of temples, souvenir and thangka shops, and women in bright saris selling fruits, vegetables and flowers in the street squares. 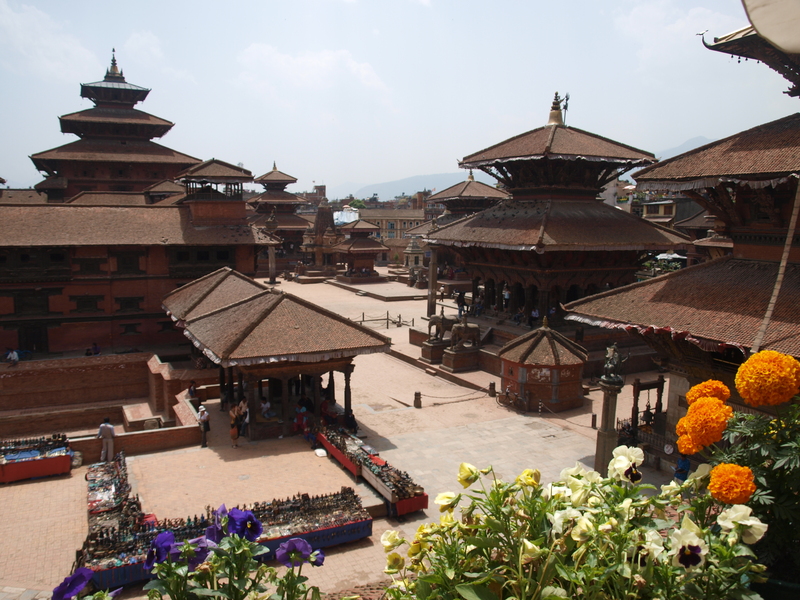 Doug joined us in Kathmandu and we spent one afternoon visiting Durbar Square, as well as the Durbar Square in the nearby city of Patan. 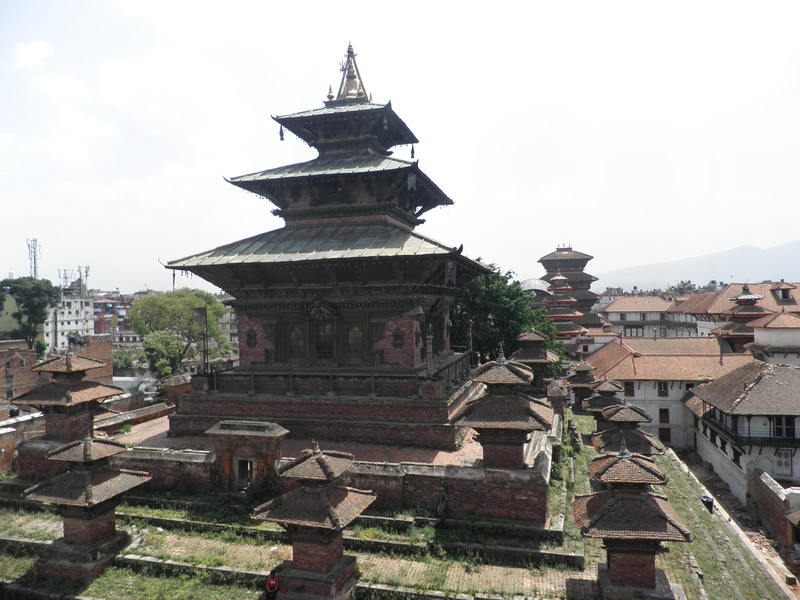 Both were stunning, but we all preferred the temples of Patan. Another afternoon, Doug and I visited Swayambhunath, or ‘Monkey Temple’. Yes, there are monkeys running around everywhere, but don’t go near them or they will totally swipe your camera and probably claw your face off. 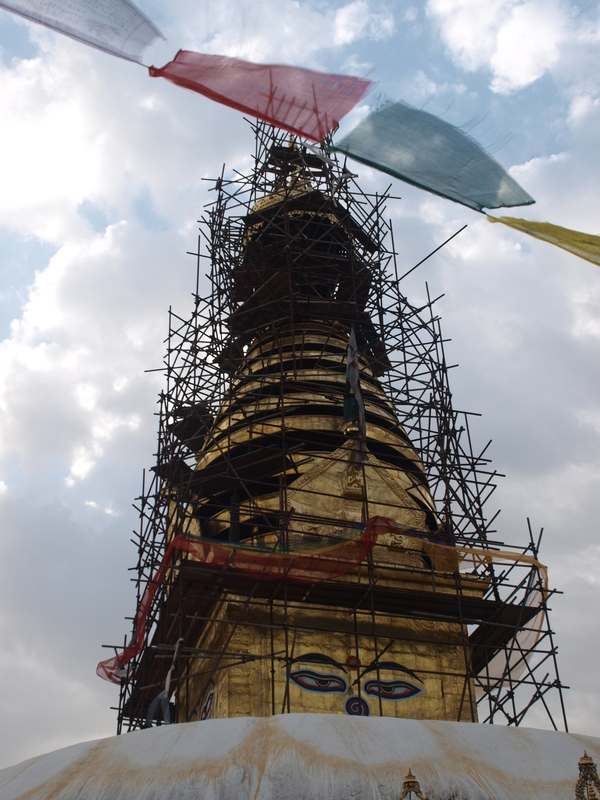 Of course, the stupa was under repair, so my hopes of a photo with the beautiful golden stupa strung with Tibetian prayer flags were dashed. Another entertaining afternoon would be spent at the local post office. Kelly and I had a package that needed to be shipped home, but instead of taping up the box and slapping a label on it like most other countries, the Nepalese take their packaging to a whole new level. One woman sits in the office tearing strips of fabric while another man measures your box and actually sews a pillow case from the cloth to stuff the package in. Then another man with a candle melts a stick of wax and ‘seals’ your package by dotting the seams with globs of the wax. Then you write your shipping address on the cloth with a marker. Upon completion of the packaging, your box looks like cargo from a pirate ship. It’s hilariously awesome.